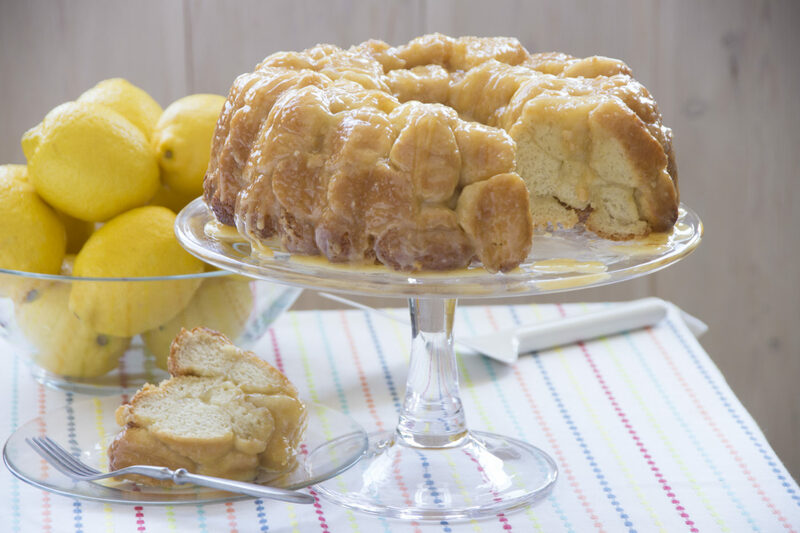 Fresh lemons make these pull aparts a flavorful dessert everyone will love. Cut 8 of the rolls into 4 equal pieces each and set aside. Combine 1 1/2 cup sugar and lemon zest. Dip each piece of dough in melted butter and then in sugar zest mixture. Place in the bottom of a well sprayed bundt pan. Combine filling ingredients and blend until smooth. Pour half of the filling mixture over the rolls in the bundt pan. Repeat above process with 8 more rolls. Cut last 8 rolls and dip in butter and sugar zest mixture. Layer on top. If you have any sugar zest mixture left, sprinkle on top of rolls. Cover with plastic wrap and let rise until about one inch below the top of the bundt pan. Remove wrap and bake at 350°F 45-50 minutes. Cover with foil last 20 minutes of baking to prevent over browning. Remove from oven and invert immediately onto serving platter.